Home Books The top 30 vascular plant species in Britain? Which are the commonest species in Britain? The answer to Dr M’s question depends on what Dr M means by “common” and what Dr M means by “Britain“! One invaluable source of information which helped Dr M with this particular botanical conundrum (and many others too!) is the New Atlas of the British and Irish Flora published by Oxford University Press as a large (and very heavy!) hard copy volume in 2002. This beautiful volume includes descriptions and distribution maps (“dot maps”) for 1486 native vascular plant species and almost 1000 additional introduced and naturalised species in England, Wales, Scotland, Northern and Southern Ireland, the Isle of Man and the Channel Islands. The maps are the result of meticulous botanical recording carried out over many decades (the first Atlas was published in the 1960s) but most recently coordinated and carried out by staff at the Centre for Ecology and Hydrology (CEH) and Botanical Society of the British Isles (BSBI) and an army of professional and amateur botanists who make up the Vice-county recorders of the BSBI. The Online Atlas of the British and Irish Flora includes more species (over 4000 in total) and more up-to-date information and so is the best source for information on distribution and status of British plant species. Spare moments at a computer could not be better spent than checking details and distribution of your favourite plant species! So which are the commonest species? Well by “common” Dr M refers to the Atlas which details presence in the 10 km grid squares of the Ordnance Survey National Grid. So the “commonest” species are the ones which have been recorded in the largest number of grid squares. And the answer is? 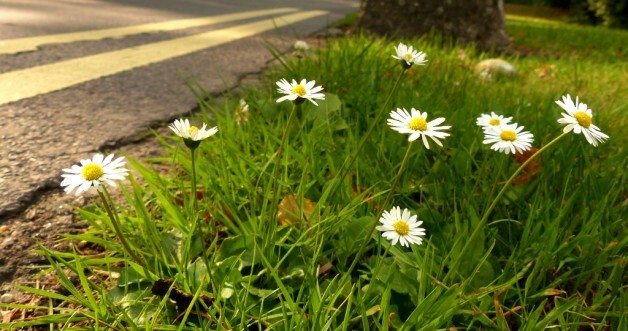 Well the featured image gives one example which is the commonest member of the Asteraceae – the humble but beautiful Daisy (Bellis perennis). This has been recorded in a total of 2797 out of the total of 2823 (99%), not bad going for such a wee little plant! No wonder it is such a familiar sight in garden lawns, grassland and disturbed ground everywhere! But what of the other 29 of the top 30 species? Well that’s for another post! But meanwhile, why not draw up your own list, which do you think are in the top 30? Then you can compare and contrast with Dr M’s list in due course! Post Script: If you are interested in the history of mapping the British Flora check this link for a BSBI leaflet on 50 Years of Mapping the British and Irish Flora 1962-2012 by Michael Braithwaite & Kevin Walker.